Salesforce gives organizations the ability to open Chatter to an external audience too. Chatter Customer Group represent a group of users (internal plus customers). It’s a great way to collaborate with your customers and has all the posts and files contained in your Salesforce org. You can have multiple Chatter groups based on Customer Type, geography or a single Chatter group to collaborate with your customers. Customers have limited Chatter access and can only see the groups they’re invited to and interact with members of those groups. 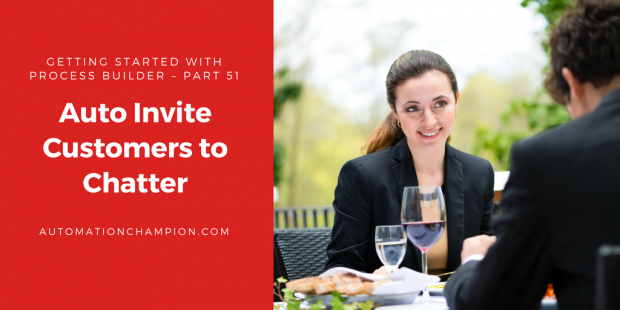 In this blog, I would like to explain step-by-step instructions to auto invite your customers to collaborate using Chatter. Let’s start with a business use case. Pamela Kline is working as System administrator at Universal Containers (UC). She has received a requirement to auto invite new contacts to Private Chatter Group Universal Container Customers. There are a few possible solutions for the above business scenario, but I’ll use Process Builder and Flow to solve it. Before proceeding you have to understand CollaborationInvitation objects in Salesforce. CollaborationInvitation: – This object represents an invitation to join Chatter, either directly or through a group. InvitedUserEmail The email address for the user invited to join Chatter. SharedEntityId ID of the user or group associated with this invitation. To invite a customer, set SharedEntityId to the ID of the private CollaborationGroup with Allow Customers turned on. 1. First of all, create a Chatter Group Universal Container Customers, set the group access to Private and also enable Allow Customers. 2. Now grant Invite Customers To Chatter system permissions on the profiles. 4. Click on New Flow, it will open the Flow canvas for you. Now create a Text variable VarT_EmailAddress to store the customer’s email address (we will pass the email address through Process Builder). 6. Save your flow with name Invite Customers to Chatter and close the canvas. Don’t forget to Activate the Flow. 2. The next step is to add entry criteria. For this click on Add Object, select Contact object and for the entry criteria, Select only when a record is created, as shown in the below screenshot, once you are done click on the Save button. 3. The next task is to add Process Criteria, To do this click on Add Criteria, enter Name, Type of action and set filter conditions (In this case set [Contact].Email Is null False, as shown in the following screenshot.